Teams participating in the 2014 High School Division will be receiving the 2013 DNA Distribution kit plates which were entirely revamped. Each year, the DNA Distribution is prepared and manufactured over the course of a month in April/May, which would not leave much time for high school teams to use these kits! 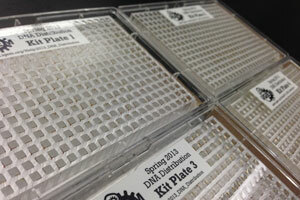 Therefore, we have opted to send the 2013 DNA kit plates. The kit contains over 1000 part samples, all of which have been quality control-tested through sequencing, AB test plates, and restriction digests. While there is not enough DNA for assembly, you will be able to transform the DNA into competent cells and then make your own glycerol stocks of any part you wish. Whether you’re new to iGEM and the Registry of Standard Biological Parts or an experienced participant, please make sure to read through the Distribution Handbook. If you're new to the Registry, iGEM, or synthetic biology, you'll want to read through our Help pages before you get started. The Help page is the best place to start, and will take you through the basics. We’ve made some important changes to this DNA Distribution! In making this year’s distribution, we selected only parts with samples that were sequence confirmed or ends confirmed (long parts > 1600bp). All parts underwent an additional round of our quality control process: sequencing, restriction digests & gels, and antibiotic testing. This has ensured a high quality distribution, in which all parts have a sequence result of Confirmed, Partially Confirmed or Long Part. However, be sure to take a look at the quality control results before using a part! Note: We're still in the process of curating the Distribution, and removing samples that did not meet our requirements! Storage: The distribution kit plates are comprised of dried DNA, so they are stable at room temperature. However, once the DNA is resuspended in any of the wells, we recommend either storing the kit plate with its plastic cover in a -20C freezer, or aspirating the rest of the resuspended DNA from the well and keeping it separately in a -20C freezer. In addition to the new parts that have been submitted to the Registry, we have transferred over many of our existing sequence verified parts into pSB1C3, the Registry’s standard shipping plasmid backbone. All parts in DNA Distribution Kit Plates 1 to 4 are in pSB1C3. all parts are flanked by the BioBrick prefix and suffix. pSB1C3 has our standard primer sites (VF2 and VR), so you can sequence all parts with the same primer set. 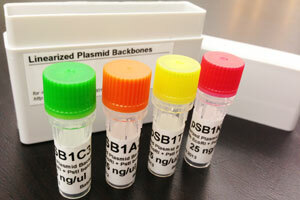 The 2013 Distribution Kit includes a set of four linearized plasmid backbones: pSB1A3, pSB1C3, pSB1T3, and pSB1K3.m1. These plasmid backbones have been prepared via PCR and purified. Prior to ligation the linearized backbones will need to be digested with with EcoRI, PstI and DpnI (DpnI is optional: to cut up original template DNA used to create linearized plasmid backbone), leaving two ends ready to be ligated to a BioBrick part. All 2013 submissions will need to be in pSB1C3, so we recommend using our pSB1C3 linearized backbone for that purpose. See the Linearized Plasmid Backbone protocol page for more in-depth instructions on how to use them and make your own. Storage: The Linearized Plasmid Backbones (25ng/ul at 50ul) should be stored at 4C or -20C. Before using the DNA plates, you should search the Registry for useful parts, which will also tell you if we have sample in stock, its location (if they're in your 2013 Distribution), requirements, quality control, etc. You can also browse the contents of the 2013 Distribution in their entirety by visiting the Repository. The Catalog of Parts and Devices will allow you to browse parts and devices by various criteria, including function, chassis, standard, etc. The Search Menu will let you search by text or part name. It is also possible to see the contents of the Kit Plates in their entirety. You can look at the DNA Repositories section on the main page. Click on 2013 Distribution to see the contents of all of your kit plates. Click on the 2013 Kit Plate of your choice, which will list all parts by their part name (BBa_..) in a plate along with their quality control information. Or you can click on the small part diagram below each Kit Plate link: "See a summary of the parts in this plate." These options will show you what is in each well of your plate, however they are not the best way to find specific parts you would like to use. If you find a part that you would like to use, you need to make sure that a sample of the part is in stock. There are many parts on the Registry that people are still working on, or have decided not to continue working on anymore. This of course means that the DNA is not available in the Registry's Repository. The simplest way to tell whether the part has a sample is to look at the top right of the part's Main Page. If the part has an available sample the top part of the box will be green and say "Sample In stock." Here at Registry, we want everyone to take a look at the results of the quality control measures we've taken this year and previous years, in order to make an informed decision when choosing to use a part. We've made sure to update the online repository for the Spring 2013 distribution with our quality control results. The best way to use our quality control information is to use it on a part by part basis. As you design your project, make sure to check every part that you're interested in for its QC data. After searching for a part in the registry and arriving at its main page, click on the Get This Part link which will take you to the section listing various quality control information for a samples of that part and its location within the registry. DNA Distribution Kit Plates: The distribution kit plates are comprised of dried DNA, so they are stable at room temperature. However, once the DNA is resuspended in any of the wells, we recommend either storing the kit plate with its plastic cover in a -20C freezer, or aspirating the rest of the resuspended DNA from the well and keeping it separately in a -20C freezer. Linearized Plasmid Backbones: The Linearized Plasmid Backbones (25ng/ul at 50ul) should be stored at 4C or -20C. Locating Your Part from iGEM Videos. The foil covers on the (384 well) Kit Plates can be easily punched through with a pipette tip. Unfortunately, the foil cover will also obscure both column and row markings. You can still find your part by correctly orienting the plate using the two notched corners as markers: well A1 is located at the upper left corner of the plate when the long side of the plate with the notched corners is considered the bottom. 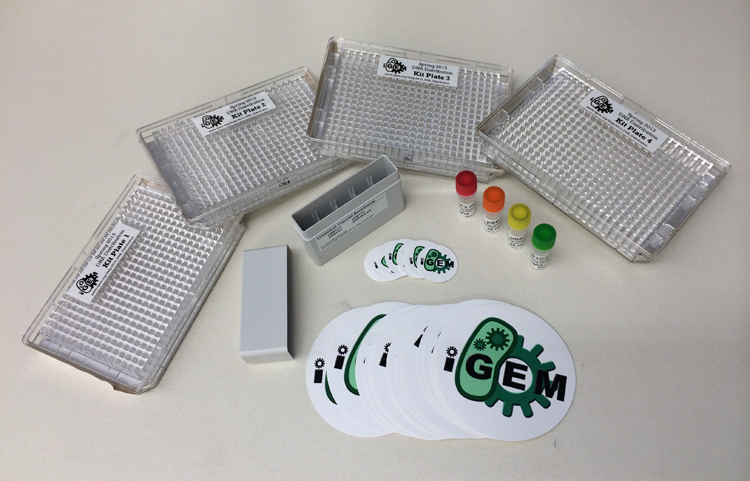 Before you use the DNA in the Distribution Kit Plates, be sure to test the efficiency of your competent cells with the Transformation Efficiency Kit. With a pipette tip, punch a hole through the foil cover into the corresponding well of the part that you want. Make sure you have properly oriented the plate. Do not remove the foil cover, as it could lead to cross contamination between the wells. Pipette 10uL of dH2O (distilled water) into the well. Pipette up and down a few times and let sit for 5 minutes to make sure the dried DNA is fully resuspended. We recommend that you do not use TE to resuspend the dried DNA. Transform 1ul of the resuspended DNA into your desired competent cells, plate your transformation with the appropriate antibiotic* and grow overnight. Pick a single colony and inoculate broth (again, with the correct antibiotic) and grow for 16 hours. Use the resulting culture to miniprep the DNA AND make your own glycerol stock (for further instruction on making a glycerol see this page). We recommend using the miniprepped DNA to run QC tests, such as restriction digests and sequencing. * To know which antibiotics to use, look at the plasmid that the part is in. The naming scheme for plasmids is specifically designed to indicate antibiotic resistance.